Beechford is a small beach side town on the northern coast of Tasmania. 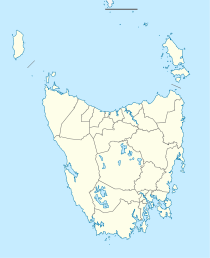 It is just 13.6 kilometres (8.5 mi) away from Georgetown and 48.0 kilometres (29.8 mi) north of Launceston and Beechford is also the place where the Curries River joins up with the Tasman Sea in Bass Strait. The village is surrounded by farmland, and land administered by Crown Lands, the Dept. of Defense and Parks and Wildlife, creating a natural corridor of unbroken sea views. The turnoff to Beechford is found on the Georgetown to Bridport Road through Lefroy, however it is a place that is yet to be "discovered" by tourism. Alternately, visitors may turn east from the East Tamar Highway, just before Hillwood, onto Bullocks Head Road which leads directly to the Bridport Highway, which then intersects the Beechford turnoff. Before entering Beechford, you must pass through the small town of Lefroy, which was once a mining town. Beechford lies just south of the military training area of Stony Head. Once a populated town with its own small shop (closing sometime during the mid 1980s) when there were many more permanent residences, Beechford now has no store with the closest being in the regional centre of George Town. The area has a warm, relatively dry micro-climate. Beach access is via a small sand track near the now-defunct football oval, or over a small foot bridge that crosses a tidal estuary. The coastline and white sandy beach is very attractive, and is often used for walking, mountain biking, swimming and fishing. Use of vehicles on the beach is discouraged for safety and environmental protection reasons: the beach and coastline is monitored by a Parks and Wildlife ranger, and police frequently visit the area - fines have been issued to owners of unregistered vehicles, and for any use of vehicles that poses a danger to wildlife, environment, or the safety of people using the beach. Other amenities include public toilets, a small children's playground and a free camping area. ^ Australian Bureau of Statistics (27 June 2017). "Beechford (State Suburb)". 2016 Census QuickStats. Retrieved 23 July 2017. This page was last edited on 27 February 2018, at 00:50 (UTC).